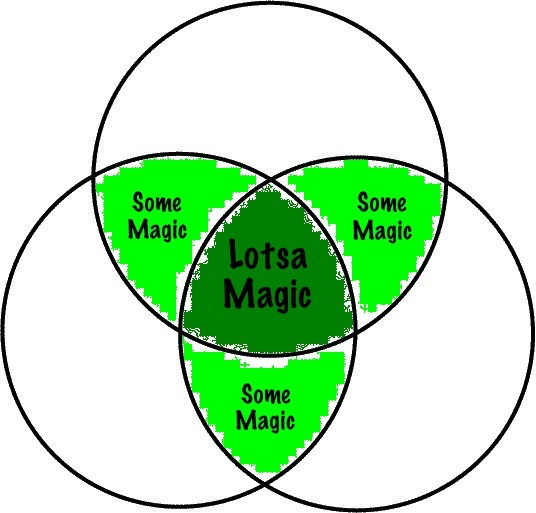 The Venn diagram is one of the most beautiful diagrams, for it represents the magic that happens when we combine our interests. On February 1, 2012, I attended a talk given by John Scurlock. Called "Heart of the Distant Mountain," John presented aerial photographs he had taken while flying over the Cascade mountains. The photographs in John's presentation were amazing. But more amazing was the story of how John became an aerial photographer. 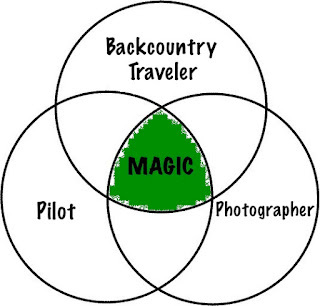 John is a backcountry traveler, John is a pilot, and John is a photographer. Let's visual John in terms of a Venn diagram. You can see that by combining his interests, John created a sweet magical spot. John has been a backcountry traveler for years. He has had many adventures as a skier, a climber, and a mountaineer in the North Cascades, the mountain range near his Concrete, Washington home. John has been a pilot for decades. Having developed a love for flying in his early childhood, he labored for ten years to build his own tiny yellow Van's R-V6 airplane from a kit. John had been a photographer ever since he was a kid. He recalls the good ole' days of developing film in dark rooms. Once John finished constructing his homebuilt plane, he was ready to take his tiny yellow aircraft for a spin. His interest in the nearby Cascade range propelled him to take his first flight over Mt Baker, one of the snowiest places in the world. As he flew over the mountain, he held his point-and-shoot camera up to the plexiglas canopy and captured rarely-seen views of the glaciated volcano. In doing so, John had established his magic. John's aerial landscape photography and close-range peak flying is a unique combination of interests. Not only does John deal with the typical challenges of photography, such as exposure and composition, but he does so while also grappling with the harsh conditions of flying an airplane...in the mountains...in the middle of winter. John is standing smack-dab at the center of a beautiful Venn digram. He is the embodiment of the magic that happens when we combine our interests, thereby creating a unique niche. What's particularly inspiring about John's niche is that it combines the things John loves to do. John's magic was evident in his infectious passion. John's magic was so infectious that I've questioned numerous time over the years: How can I replicate John's magic? We all have a unique combination of interests and curiosities. By combining and sharing these interests, we are able to make our unique contribution to the world. 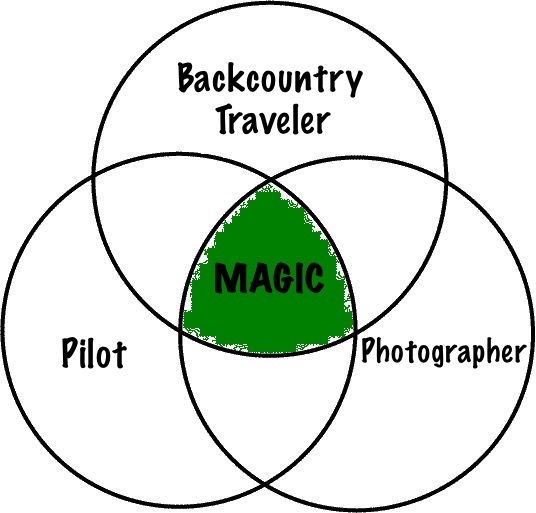 While the intersection of two of these interests is magical, the intersection of three or more interests is exponentially more magical. We owe it to not only ourselves, but to the world, to nurture and manifest our interests. Note that we are talking about interests here, and not skills. Though we may be skilled in certain areas, we may not necessarily enjoy doing those certain things. Case in point: In my working days, I was skilled as a tax accountant and a product manager. While I was skilled at these jobs, tax accounting and product managing were not interests of mine. I did not pursue them in my free time. They didn't get me out of bed in the morning. They didn't cause me to radiate an inner excitement whenever I talked about them or thought about them. Though we may not be experts in our interests, our passion for those interests makes up for any lack of skill. John is not the best mountaineer, nor the best pilot, nor the best photographer. But he sure as hell is the best, most respected, and most sought-after close-range peak flying aerial photographer in the Cascades! And, you have shown a reason why math in high school is important! The lament "When will I ever use this stuff??" can be answered with "When you follow Sarah in Honoring My Compass!" Ha! 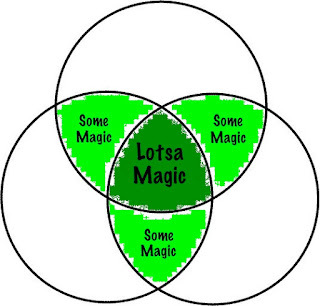 Venn diagrams are the best! So are mind maps! I'm looking forward to the day when you retire so you can pursue Mountainstroh interests full-time! Good luck with that, kiddo!